I was stunned. Pleasantly stunned. Roberto Ferrata uncased his new titanium Fabbri 12 gauge shotgun and handed it to me. “I want you to use my gun today.” I received the magnificent firearm and held it as gently as if it were a newborn baby. Bringing it to my shoulder, I noted with conflicting emotions and thoughts that it fitted perfectly. We were standing in the hunting room of the historic Castelnuovo estate located in Siena, Tuscany. More formally named the Tenuta Castelnuovo Tancredi, the estate is owned by Guido del Greco and his wife, Lee Venturini and has been in Guido’s family, as I understood Guido’s narrative, for more than four hundred years. A Fabbri Titanium in 20 gauge engraved by Valerio Peli of Creative Art (photo: Artfact). “Do you note that it is raining outside?” I asked Roberto with arching eyebrows and a tone hinting of incredulity. Although the rain was slight, it was more than a fine drizzle. The notion of taking a gorgeous Fabbri into such a hostile environment impressed me as heretical. Roberto smiled. “The Fabbri is a tool designed to be used,” he said with an impish smile. “You are my guest. You use my shotgun.” That’s strong, I said as I made a fist and jabbed the air. The door from the gun room that led outside was open, providing an unobstructed view of the rolling Tuscan hills, stands of eucalyptus trees and spears of sunlight that penetrated the cloudy gray sky as if in a Titian oil painting. I finished dressing, zipping up my rubber boots and layering shirts and a sweater under an oiled rain-proof garment. Roberto, Guido, his brother, Ghino, and a friend, Fabbio, and I got into a truck carrying in the rear the energized yelping dogs. We drove about a mile or so on gravel and mud roads to our first hunting field. The beauty of the place stirred the soul. In all directions the hills were dotted with villas topped with red tiled roofs, some dating back as much as 1,000 years. The rain abated and became more of a fine mist. We knew the hunting would be challenging because the dampness impeded the transfer of the scent of the birds into the air for the dogs to discern. Nevertheless, we were optimistic because we saw many pheasant as we entered the grounds of the estate and the dogs did bound about with enthusiasm. Roberto and I walked along the edge of a section bounded by thick brush, tall grasses and dense growths of trees. Two pheasant arose from my right. Roberto swung quickly with his Beretta and knocked the farther bird down with the second barrel as Ghino, a few paces ahead of us, adroitly dispatched the other. 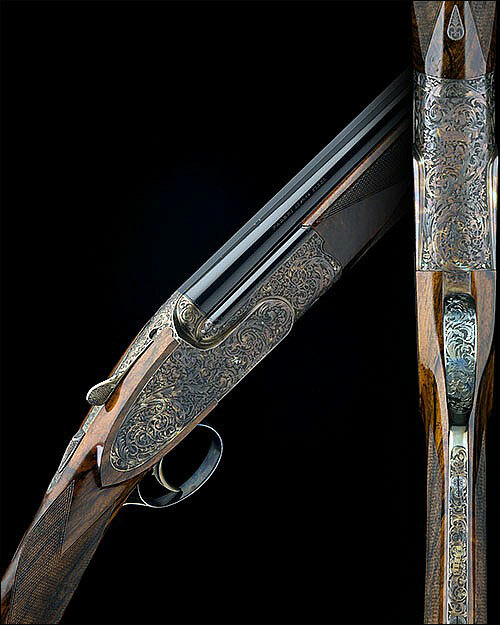 I confide that I carried the Fabbri with caution as I would any sporting arm that is priced in the range of a Bentley. As a matter of habit, I kept wiping the water droplets from the Fabbri’s diamond-coated stainless steel barrels, an action that I came to learn was thoroughly unnecessary. Guido del Greco, center kneeling, and Lee Venturini, standing top right, owners of Castelnuovo, and friends. A pheasant flushed about 40 yards in front of me and, gaining altitude like a missile, presented the classic sporting clays crossing shot. I applied my typical swing-through shooting method and, using the lower barrel, hit the bird solidly. “Un tiro bello,” a beautiful shot, Roberto enthused. We hunted for another two hours or so. The rain had let up by now and the warming air was infused with the delicious scents of grass and earth. I continuously zipped and unzipped, buttoned and unbuttoned, my clothing to adjust to the slightest differences in temperature, rain and wind. Small deer darted out of the thickets and two rebok ran from field. 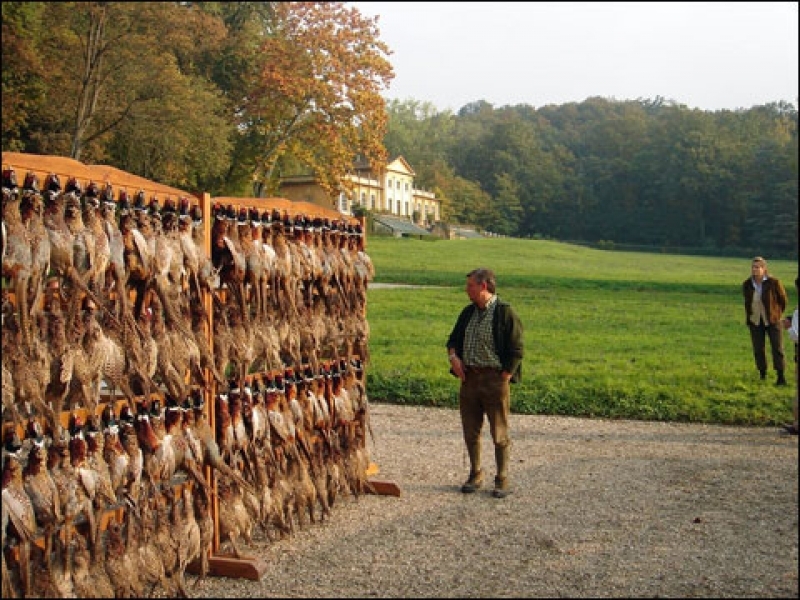 Guido’s estate is not heavily hunted but from time to time he offers driven pheasant shoots which, he says, also boasts the highest pigeons in Italy, flying as high as 160 feet. 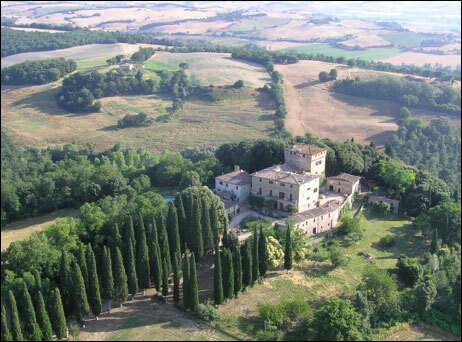 For my wife, Nancy, and I visiting two estates described as “castles” in one holiday trip was extraordinary, even more so when those castles are situated in gorgeous Siena. Borgo di Castelvecchio is owned by Alessandro Gaetani d'Aragona and his elegant wife, Simona. A borgo is a very small community encased in a fort. Borgo di Castelvecchio is one among several castles and fortresses overlooking the Val d’Orcia, a region of Tuscany that extends from the hills south of Siena to Monte Amiata. The main structure of Castelvecchio is, indeed, a castle, where the lord lived and which was built approximately one thousand years ago. A borgo was constructed to be self-sufficient for months to survive attacks from the many invading armies that then existed. The borgo contained a granary and housed animals. Its residents included craftsmen, cooks and metal workers who had the skill to build firearms. The gun room is lined with wood shelves; the walls covered with paintings and lithographs depicting hunting scenes. The air was infused with intense scents of oils, leather and earth. Rifles and shotguns filled several racks. Riding apparel hung from the walls and hunting shoes seem to grow from the floor like crabgrass. Boxes of ammunition and shooting accessories were piled onto well-worn wooden tables. Roberto had hoped to take me pheasant hunting that afternoon but the weather foreclosed that opportunity. We did, however, hunt boar that evening instead. Roberto did take one distant shot at a medium-sized boar with his new Zoli over/under rifle but, alas, in the disappearing sunlight, was unsuccessful. 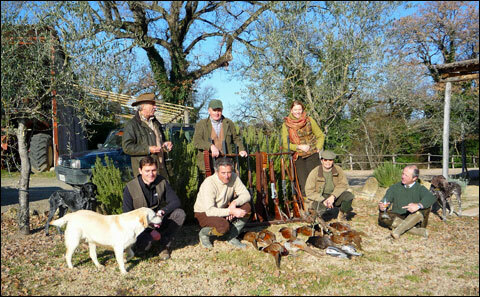 Alessandro and Simona host guests from around the world, many of whom visit to hunt pheasant, boar, roe deer and rebok on the property and on properties of nearby landowners, some of which offer the finest wing shooting in Tuscany. I first met Tulio Fabbri in March, 1997. I was visiting Gardone on a writing assignment about engraver Mauro Dassa of Incisioni Dassa. Mauro took me to Fabbri’s factory, which was then located in Consesio, a few kilometers north of Gardone. On that visit I met Fabbri’s founder, Ivo Fabbri, and was given a tour of the factory. The function of every machine was explained to me in detail. I learned that every component, down to the smallest screw and pin, was made in the factory. The author holding the Fabbri Titanium with Dario Anguissola of Fabbri. My education about Fabbri shotguns began then and has continued to this day. A few days into this trip Roberto Ferrata introduced me to Dario Anguissola, Fabbri’s new marketing director. Tulio’s selection of Dario was inspired. Dario has been world champion in bunker trap, world champion in live pigeon shooting and world champion in the helice or ZZ bird competition. You can find dozens of videos of Dario shooting and receiving trophies on YouTube. 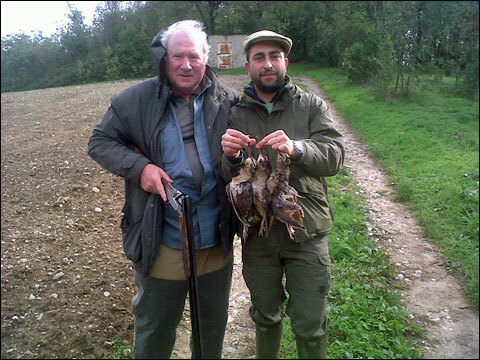 Beyond his stature as an elite shotgun shooter, Dario is one of the most delightful, ebullient chaps one can ever meet. Dario picked Nancy and me up from Roberto’s townhome overlooking Lake Garda, and took us to Nave, a small village in Brescia, where Fabbri’s new factory is located. Tulio greeted us, re-introduced me to his father, and gave us a tour of the factory. The factory was as clean and spotless as a well-maintained hospital. No odors of oil or machinery were present. Indeed, the atmosphere was antiseptic. “This is a new concept in gun factories,” Tulio said. He explained that the factory was his home. “This is where I live. This is my Ferrari.” I interpreted his words as an admission that his work pervades his life. He is an admirable husband and doting father, I have heard from independent sources. But his work is the font of his professional pride, which is considerable and, as the producer of the finest shotguns in the world, is justifiably so. I share a few examples of the consequences of Tulio’s obsession with perfection. Fabbri continues to design every part of its firearms, modernizes equipment continuously, uses state of the art machines, CAD/CAM systems and simulation software and employs the most highly skilled workers. As examples of his near-neurotic pursuit of technical perfection, Tulio showed me his trigger system. The components are made of titanium and are designed and hardened to such a degree that the trigger pull weight will not alter even after firing one million cartridges. The barrels are made of stainless steel or the strongest non-stainless steel. As an illustration of their strength, Tulio informed me that the barrels will not explode or rupture if a 12-gauge cartridge is fired into a 20-gauge cartridge lodged inside the 12-gauge barrel. Tolerances are a thousandth of a millimeter. Tulio handed me a partially shaped action. The curved knuckle area of the action block was perfectly smooth. Amazingly, it had been shaped by a machine rather than being polished. Fabbri’s titanium shotgun was cutting edge in the sporting arms business and boasts several extraordinary features. The titanium bar for the action is approximately one pound lighter than the bar of the stainless steel action. The barrels of the titanium grade shotgun are made of stainless steel and have a diamond light coating (DLC). The DLC is the hardest known coating material and is unsurpassed in qualities of wear resistance, protection against scratching and attacks from atmospheric moisture and chemical vapors. Finished by the finest engravers, the most luxurious wood and the most elegant aesthetics, Fabbri shotguns are spoken of as reverentially as connoisseurs speak of the great English iconic Boss or Purdey firearms. That evening Dario took Nancy and I to the Ghedi range in the Lake Garda district of northern Italy to shoot bunker trap and helice. Dario brought two 12 gauge Fabbri shotguns, one of which was his own engraved titanium shotgun. Engraving a titanium action is much more difficult than steel and adds considerably to the engraving cost. As a favor to Dario, the range manager allowed us to shoot in the evening after the normal closing time. I had never shot either the helice or bunker trap formats. The helice game is designed to replicate live pigeon shooting. A device which looks like a propeller is launched in a spinning motion from a trap. Attached in the center of the propeller is a plastic white disk. The format has five traps in a line perpendicular to and about 50 feet in front of the shooter. One target is launched from each trap. To score a “dead bird,” the target must be hit so that the white disk separates and falls within a hemisphere boundary about forty yards from the shooter. The game is fast and challenging. Dario shot first and hit all five targets. I shot next. I confess it is a little intimidating to shoot with a world champion in three disciplines and to shoot the finest shotgun in the world. Missing seems to be a sin. I hit two targets. Nancy shot and hit two targets. I shot again and hit all five targets. Dario said I was his hero. We walked to the bunker trap ranges. This format has five stations like American trap. The targets, however, are significantly faster and are made of harder material. It’s a tough game. We each shot a round of twenty-five targets. The titanium Fabbri moved quickly and under control. Nevertheless, I was aware that it was a pound or so lighter than the target guns I usually shoot. However, as much as I would like to, I cannot attribute my missing the targets to that deviation. The crispness and solidity of the trigger are extraordinary. Dario did not hit all the targets, which made it less embarrassing that I hit only a few. Of course, at my skill level, it is tough to miss all of them. Dario shared some shooting tips with me. Gun balance and fit are paramount. He opined that proper gun fit is 90% of shooting success. Dario uses very tight chokes (8/10 and 10/10) and he emphasizes the importance of the hold point. In bunker trap, for example, Dario holds 3¼ feet over the trap and keeps the gun motionless as he awaits the release of the target. As we have all read and heard innumerable times, Dario also emphasizes the importance of keeping the head on the stock. The last two days of my visit I had the pleasure to hunt with Dario and Roberto Ferrata at Roberto’s magnificent property, Arzaga Drugolo, which overlooks Lake Garda. Arzaga Drugolo is the oldest hunting club in Italy. During this euphoric experience I had the rare opportunity to shoot two Fabbri shotguns. Vero, the hunting guide, and his dog, Pulce, which means “devil,” directed us and a few other guest hunters over Arzaga’s gently rolling hills. We walked for several hours as I cradled Roberto’s Fabbri like an infant child. In addition to the pheasant and grouse we shot, Dario and one guest shot four woodcock. At one moment, Dario was using Giorgio’s .410 when a pheasant flushed. Dario fired and the bird dropped like an anchor, illustrating, yet again, a skillful shooter can successfully shoot any shotgun. Our trip to northern Italy and to Tuscany was what is often referred to as a once-in-a-lifetime experience; the kind of experience I hope happens a few more times during my life. 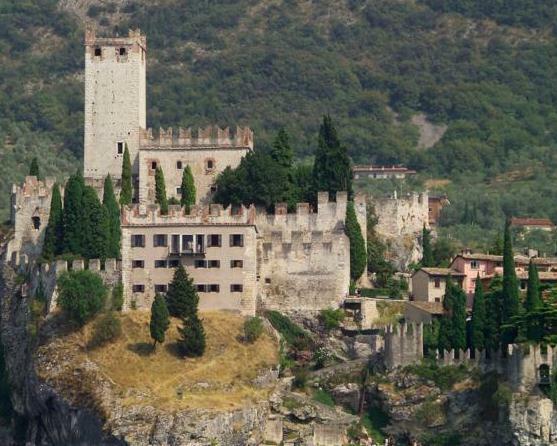 The soul-churning beauty of Castelvecchio, Castelnuovo and Arzaga Drugolo will never be forgotten. And, as a shotgun enthusiast, visiting Tulio Fabbri and shooting Fabbri shotguns with Dario and Roberto rank high among the highlights of my shotgun experiences. Michael Sabbeth is a lawyer in Denver, Colorado. He lectures on ethics and rhetoric to law associations and civic and business groups. He is the author of The Good, The Bad & The Difference: How to Talk with Children About Values. Please visit his website at www.kidsethicsbook.com. The book can be ordered on Amazon: http://tinyurl.com/c5flmmu. Michael Sabbeth is a lawyer in Denver, Colorado. He lectures on ethics and rhetoric to law associations and civic and business groups. He is the author of the The Good, The Bad & The Difference: How to Talk with Children About Values. Please visit his website at www.kidsethicsbook.com.